Answer: They’re both f*cking near water. 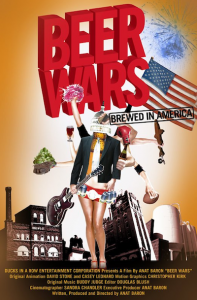 Beer Wars (2009) is a documentary narrated by the writer/director, Anat Baron, a former executive at Mike’s Hard Lemonade. It follows the craft beer industry and its fight against the Big 3: Anheuser, Miller and Coors, the latter of whom have since merged. The production is reminiscent of Morgan Spurlock’s work, and whether or not that’s a good thing is up to you. Personally, I found the illustrations a little juvenile / annoying, but then again, I’m picky and prefer information presented as plainly as possible so I can draw my own conclusions. Another minor gripe: I didn’t like the blind taste test. While I suspect that most people have a hard time differentiating Miller Lite from Coors Light and Bud Light, who knows how many people got it right and that footage was cut. Watching on Netflix Instant has the drawback of not seeing the deleted scenes, so I have no idea if they acknowledge that some can distinguish their domestic lights. I found the part on product placement and the little guys vs the men intereting. The owner of Dogfish Head, noted in a past post, talks about how Bud Light is available in so many different sizes — 6, 12, 18, and 30 — that their aggregate shelf space creates a virtual billboard. Microbrews are generally just sold in 6 packs, so will have little visible shelf space and it’s even worse if they aren’t placed at eye level. Another interesting point was that the supply chain tends to shut out the smaller guys, because the larger players have oligopolistic (sorry for the econ 101 reference) advantage: Carry only our products or you won’t get our business. There’s also some focus on lobbying, but that’s not so interesting, because we all know that big business, regardless of industry, is going to pay for lobbying to protect itself (see: oil/energy, automobiles, banks). All in all, it’s an interesting movie if you really care about either craft beer or small businesses in general. Otherwise, it’s not terribly engaging. Who Are the Three Philosophers?